Thought it was about time to put up some cute pictures. So here we go with Halloween! We had a great Halloween. The 28th we went to Hubby's work party where the boys got to trick or treat around the office. The 29th we had a Halloween party and trunk or treat with my moms of twins club. 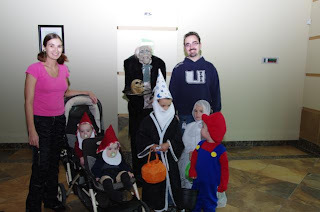 And then Halloween the boys had their school costume parades and Hubby took the older 3 trick or treating that night while I stayed home with the babies to hand out candy. A fun weekend, but way too much candy! I actually made some of the costumes this year because I didn't want to go buy any and Jason and Jakey wanted to be something we didn't already have costumes for. Jason was a wizard, I let him pick out the material. Jakey was a ghost. Nathan was excited to wear one of the older boys' old Mario costume. 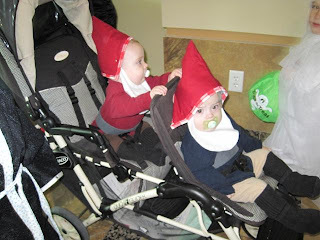 And the babies were gnomes. I just made their hats and belts, the rest was just clothes we had. At Hubby's work party. Nathan would not stop looking at the talking butler thing lol. We carved pumpkins the Friday before. Hubby's has Idaho and #1, mine is the stack of pumpkins with BOO and a ghost, we let Jason and Jakey design what they wanted theirs to look like so Jason's is the 4-eyed, 2-nosed pumpkin, and Jakey's funny shaped pumpkin got 2 faces. Nathan's had a Blue's Clues pawprint, and for the babies we just did I and C.
LOL I just realized I posted the pumpkins a few posts down already. Seriously my memory stinks!